On a summer's day, Mr Dikko walked out of his front door in an upmarket neighbourhood of Bayswater in London. Within seconds he had been grabbed by two men and bundled into the back of a transit van. "I remember the very violent way in which I was grabbed and hurled into a van, with a huge fellow sitting on my head - and the way in which they immediately put on me handcuffs and chains on my legs," he told the BBC a year later. Mr Dikko had been minister for transport in the government of Shehu Shagari until it was overthrown by the military at the end of 1983. He fled to London accused by Nigeria's new rulers of embezzlement - a charge he has always denied. Labelled "Nigeria's most wanted man", a plot was hatched to get both him and the money back. The extraordinary plan was to kidnap Mr Dikko, drug him, stick him into a specially made crate and put him on a plane back to Nigeria - alive. The Israeli anaesthetist climbed into the crate as well, carrying medical equipment to make sure Mr Dikko didn't die en route. Barak and Abitbol got into a second crate. Both boxes were then sealed. "The day had gone fairly normally until about 3pm. Then we had the handling agents come through and say that there was a cargo due to go on a Nigerian Airways 707, but the people delivering it didn't want it manifested," Mr Morrow said. "I went downstairs to see who they were and what was happening. I met a guy who turned out to be a Nigerian diplomat called Mr Edet. He showed me his passport and he said it was diplomatic cargo. Being ignorant of such matters, I asked him what it was, and he told me it was just documents and things." The police had been alerted by Mr Dikko's secretary who had witnessed his abduction from a window in the house. "I just put two and two together. The classic customs approach is not to look for the goods, you look for the space," he said. "So I am looking out of the window and I can see the space which is these two crates, clearly big enough to get a man inside. We've got a Nigerian Airways 707, which we don't normally see. They don't want the crates manifested, so there would be no record of them having gone through. And there was very little other cargo going on board the aircraft. "If you want to hide a tree, you hide it in the forest. You don't stick it out in the middle of Essex." But any cargo designated as a diplomatic bag is protected by the Vienna Convention from being opened by customs officers. So Mr Morrow got on the phone to the British Foreign Office. "To qualify as a 'diplomatic bag' they clearly had to be marked with the words 'Diplomatic Bag' and they had to be accompanied by an accredited courier with the appropriate documentation. It was fair to say they had a Nigerian diplomat - I'd seen his passport - but they didn't have the right paperwork and they weren't marked 'Diplomatic Bag'," he said. The decision was taken that the crates could be opened - but it would be done by the book. That required the presence of a Nigerian diplomat, but as Mr Morrow pointed out, one was already on hand. 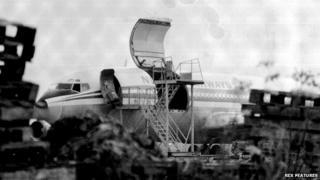 By now, the crates were up on special trolleys ready to be loaded on to the plane. "Peter, the cargo manager, hit the lid on the bottom and lifted it. And as he lifted it, the Nigerian diplomat, who was standing next to me, took off like a startled rabbit across the tarmac," Mr Morrow said. "You have to remember we are on an airfield which is square miles of nothing. He ran about five yards (4.5m), realised no-one was chasing him and then stopped. He parked a forklift truck so its tines lay across the top of the crate so it couldn't be opened. Mr Morrow dialled the emergency number 999. "My name's Morrow, from Customs at Stansted. We've got some bodies in a crate. Do you think you can send someone over," he recalls saying. "They said: 'We'll send an ambulance as well.'" After half an hour, police started to arrive, and they opened the second crate. Inside they found an unconscious Mr Dikko, and a very much awake Israeli anaesthetist. Mr Dikko was lying on his back in the corner of the crate. "He had no shirt on, he had a heart monitor on him, and he had a tube in his throat to keep his airway open. No shoes and socks and handcuffs around his ankles. The Israeli anaesthetist was in there, clearly to keep him alive," recalls Mr Morrow. The kidnappers in the other crate were unrepentant. They said Mr Dikko was the biggest crook in the world. The Nigerian intelligence officer and the three Israelis all received prison sentences in the UK. Diplomatic relations between the UK and Nigeria broke down and were only fully restored two years later. The Nigerian and Israeli governments have always denied involvement in the kidnapping. Mr Dikko returned to Nigeria the following decade and still lives there. Mr Morrow was commended for actions that day by the head of UK Customs, who described the incident as a "very tricky situation". Alex Last's report was broadcast on the BBC World Service's Witness programme. You can download a podcast of the programme or browse the archive.